Science and Art, like Ebony and Ivory, in perfect Harmony. I can still remember watching ‘Medical Detectives’ on the Discovery channel 20 years ago. I loved everything about DNA and genes, PCR and sequencing - somehow it epitomised what ‘cool’ was to me, and I imagined myself being able to discover stuff and talk about the microscopic world in a whole different way. In college, bacteria and genetics continued to fascinate me, and biochemistry cycles and jigsaw puzzles appeared one and the same to my imagination. What I now remember very vividly are the illustrations and the art that made the subject more interesting and so much easier to comprehend. If I was recommended a textbook with no illustrations, I never read it. My favourite book ‘Microbiology’ by the authors Prescott, Harley and Klein, taught me all I needed to know in a time when google was merely a figment of some developer’s imagination. When I started out with my doctoral work, literature research was imperative and although I hardly cared to admit back then, there were a good number of uninteresting publications that I couldn’t bring myself to read unless absolutely necessary. As a young doctoral student, I can remember just a handful of scientists who truly told a great story and made one fall in love with their work. Some told their stories through their presentations and others wrote great papers, while oddly good illustrations and graphics were just random treats. Admittedly in my own research work, I didn’t pay much attention to good illustrations, despite the world of E. coli making a darn good story and great art. Fast forward 10 years on and I suddenly find myself immersed in a pool of information (research articles, project proposals and summaries, news and views, blogs etc.) that I find extremely hard to keep up with. There’s a ton I’d love to read and learn about, a thousand scientific research topics that I probably have not even heard of and add to that the news! I reached a point when time became so precious, that I resorted to reading just the abstracts and summaries of the most interesting papers in the top peer-reviewed journals. One gets a gist of what is going on, but as the saying goes, the devil is in the detail. I began to wonder about how everyone else was keeping up with the details of good research and then going on to do amazing work in their own field of research. Obviously, we all live in the same hectic world where time is money, so how is it that the pile of “to read” publications and articles just gets bigger while your day gets shorter? I had the good fortune of getting into a project two years ago which was perfect for several reasons, but mostly because it was something I hadn’t really done before - Science communication. The project “Rational use of Antibiotics through Information and Communication” is a trans-sectoral project based on the “One Health” concept, part of an even bigger consortium “InfectControl2020” funded by the German Ministry of Education and Research. What was so interesting about it was that scientists and communication designers were coming together to create awareness among specific target groups through specially designed information tools, where art and journalism were given an important place. I loved what I did, and coming from a scientific background, working with communication designers and journalists inevitably opened up the creative side of my brain. A few years ago, I did not give science communication that much thought and I definitely wouldn’t have dreamt of picking up a pencil to sketch something scientifically related. Science often has a language problem, but I don’t think we’re ready to do anything about it as a whole community just yet. While we require a good story we also need good communication and data visualisation tools. 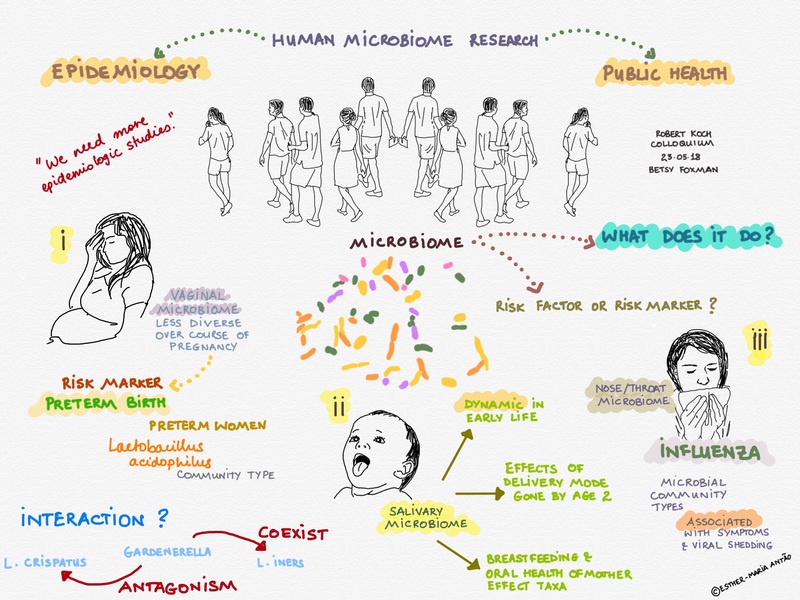 I’ve often heard “let the scientist do his job, let the artist do his, let the journalist tell the story.” I don’t quite agree and recently had an idea - why not sketch out the summary of the fantastic talk I had just heard about human microbiome research, incidentally a topic that fascinates me? I did just that and I actually remember more about what I listened to that day than any other talk in the past. Illustrating has reactivated my memory. I reckon if it helps me, it must help many who often don’t have the time to read everything, let alone be capable of remembering every single detail of what they read or hear. I’ve done a few science sketches now, and I intend to continue to do so - they say practice makes perfect! Sir Ronald Ross was said to have said “Science is the differential calculus of the mind. Art the integral calculus; they may be beautiful when apart but are greatest only when combined”. Alas, research labs are not always equipped with communication experts and graphic designers, the reason quite commonly being a lack of funding and resources for this “trivial” aspect of science and research. But science communication is no longer trivial. Perhaps when writing the next grant application, we ought to consider setting aside a budget for research communication. Illustrations make for easy reading and can reach a wider audience, hence should be made use of more. Some naturally talented scientists might be able to pull it off themselves, others may want to outsource the service, or even consider having a journalist and an illustrator join the lab. Just like the black and white keys of a piano harmonize to create beautiful music, so too can science and art come together to create a beautiful story. It brings out the best in a creative mind and I’m certain it influences the way we read, think and act in the scientific community. Above all, it may be the best way of communicating science to non-scientists and anyone who might be interested in what we do. Art may just be the common language we all speak!